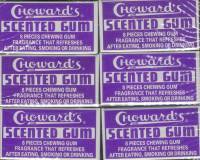 CHowards scented gum is a unique chewing gum with an unusual violet flavor known for freshening your breath. Each box has 8 pieces of gum, 24 packs per box. C Howards gum is one of those old time nostalgic candies, it first came out in 1934 and is still available in the little cardboard box just like many years ago. Each piece is square and purple in color, somewhat similar to a piece of Chiclets gum. Scented gum is a candy coated with a distinctive violet flavoring, it�s the only gum of its kind. At one time many bought these to cover up smoking and the smells of alcohol during prohibition, that tells just how far this gum goes back. Although those times are gone, many still buy CHowards gum not only for its flavor, but also for its memories. If you are looking for a gum to freshen your breath this is a perfect choice, if gum is not your thing try the violet mints they have the same flavoring.